Introducing the gorilla: the largest living primate and likely mankind’s closest living animal relative. If you are interested in learning more about our great ape brother the gorilla, you’ve come to the right place. We are going to take a closer look at this great primate, and answer some questions you may have along the way. We’ll even introduce you to a very famous gorilla…Koko, the talking ape! So why not settle in for a little fun learning as we tell you a story about our very hairy cousins in the animal kingdom? No study of this fascinating creature would be complete without first taking a look at that one word: Primate. Just what is a primate? The word usually brings up images of chimpanzees, monkeys, apes, and yes, gorillas. But there are a couple of surprises in that classification too. The first is the somewhat cat-like Lemur. These belong to the classification of lower primate, but they are definitely in there. The lower primates tend to be less “man-like” and perhaps a little less evolved than their bigger brothers. The second surprise is man themselves. Homo Sapiens, mankind itself, is a primate. So when we call the gorillas our animal cousins, we really aren’t kidding! Gorillas live in Africa, excepting their relatives that can be found in captivity all around the world. But in the wild, they live in Africa. Of course it goes a little deeper than that. There are three different breeds of gorillas, each claiming a different part of Africa for its home. The Western Lowland Gorilla: This race of gorilla can be found in Equatorial Guinea, Congo, Cameroon, Gabon, and the Central Africa Republic. This group of apes have a brownish gray coat, and the male’s white saddle goes all the way to the rear and upper thighs. The Eastern Lowland Gorilla: This breed can be mainly found in Zaire. Its coat is black, but for the male’s customary white saddle which is restricted to their backs with this race. The Mountain Gorilla: We bet you can guess where to find the mountain gorillas, can’t you? Yup, in the mountains! You’ll find them in the higher altitudes of Zaire, Rwanda, and Uganda. They resemble the Eastern breed, but their arms are a bit shorter and their hair a bit longer. These great apes eat mainly leaves and stems. The term for that is folivorous. Fancy word, huh? They also eat ripe fruit when available, but the places they live normally won’t grow enough fruit to feed a small group traveling together. That’s because the tree canopy can be so thick that the necessary sunshine for fruit to ripen properly just isn’t available. How Large Are Gorilla Traveling Groups? The size of a group of great apes can vary between just two all the way up to around 35! The group will always have a silverback male for protection. 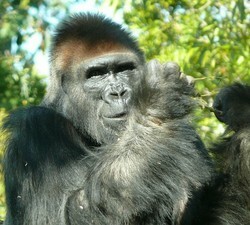 (The males are called silverbacks because of their silvery white saddle.) The others of the group will be the silverback’s female “harem” and their offspring. An interesting note is that the females will leave their “birth” family and find another group to travel with once it is time for them to breed. The males will leave of their own accord and travel in solitude until they come across and gather enough females to make a group of their own. Neither are forced out, it is simply their nature to do so. Koko was born in captivity at the San Francisco Zoo on July 4th, 1971. She has graciously allowed us into her world and has taken great strides into ours. How? By learning to communicate with us! She is often called the “talking gorilla”, but she does not in fact talk. She uses sign language. Koko can understand around 2000 words of English—not too shabby of a vocabulary at all! And she can also understand greater than 1000 signs from the American Sign Language. With her intelligence she is actually able to communicate and “talk” with people. But even a great ape surrounded by people can get lonely, and so Koko asked for a kitten. When they gave her a lifelike stuffed kitten, she was less than happy. In fact she kept signing that she was “sad”. So eventually, her humans came around and gave her a live kitten. She chose a little gray Manx from an abandoned litter and called him “All Ball”. Unfortunately a few months later All Ball escaped Koko’s cage and was killed by a car. Her handler reported actually hearing Koko weeping, missing her pet just as we humans would. The next year she chose two more Manx kittens and named them “Smokey” and “Lipstick”. She is almost as famous for her kittens as she is for talking! The average male grows to a height of around 5'6". The average female is smaller at roughly 5' even. The males can quite literally weigh in twice as much as the females. A silverback (male) can reach 400 pounds, while a female usually weighs around 200 pounds. A gorilla will live about 35 years in the wild and 50 years in captivity. These great apes stay mainly on the ground, however they can make occasional trips up into the forest canopy while foraging for food. Gorillas walk on their hind legs (kind of like humans) but they use the knuckles of their arms to pivot. While sometimes portrayed as aggressive beasts, they are actually quite peaceful. The silverback is only aggressive if one of his group is in danger. Humans can get quite close to the group without risking harm. 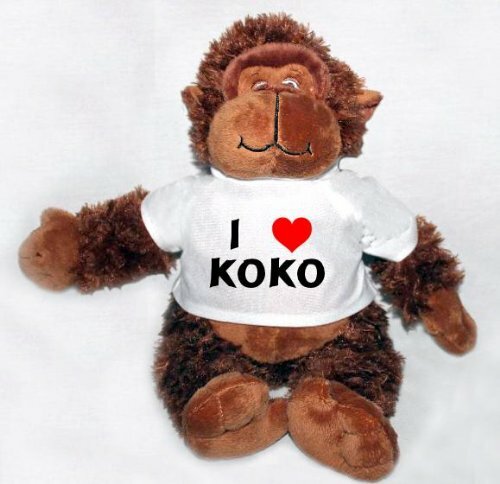 Wouldn't You Love to Talk to Koko? Love the video on Koko. She is so amazing. Gorillas in general as amazing animals. 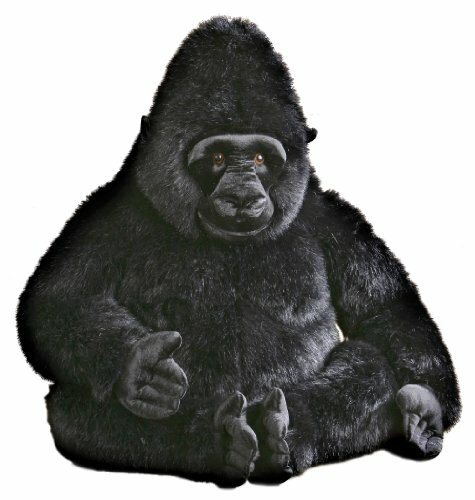 Koko is a really cool gorilla. I had no idea these creatures were such an amazing species. I'm with you, Bloomingrose. 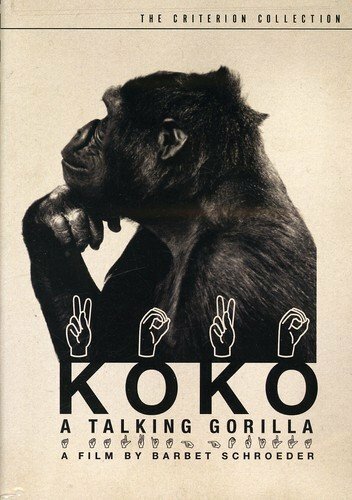 I'd absolutely love the opportunity to talk with Koko in person. She really is an incredibly intelligent and loving animal. We even have something in common--we both love Manx cats! Thank you! I love finding pages where I can learn too. I'm finding that Wizzley is great for that! I know. She simply fascinates me! I had forgotten all about Koko. What an amazing gorilla. Should Primates be Kept as Pets? Many of the smaller species of primates are, what could be classed, as cute, but would it be fair to have them as pets?